He has asked Biosecurity New Zealand to take a fresh look at the facilities where containers of imported goods are initially emptied and checked for biosecurity risks, Mr O’Connor said. 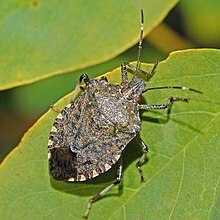 He has also asked Biosecurity NZ to investigate new ways of dealing with the increasing threat posed by the Brown Marmorated Stink Bug and other emerging biosecurity risks. “We must ensure the biosecurity risk is as far off-shore as possible. We will work with industry to ensure every part of the biosecurity system is bolstered so it is agile enough to deal with new threats as they emerge. “We are doing this after an imported stink bug was found in Tauranga late last year. There were 29 transitional facilities handling imports within two kilometres of where the stink bug was found. No further bugs had been found in Tauranga following intensive trapping and detector dog surveillance, but Mr O’Connor said “we can’t be too careful or hands-off” with biosecurity. “That is why I have requested Biosecurity New Zealand to take a fresh look at the country’s 4,518 transitional facilities to make sure they have the capacity and expertise to properly handle increasing numbers of imports in a riskier global biosecurity environment. “This builds on work last year bringing new fines into force for facilities that don’t have operators approved by Biosecurity New Zealand. Mr O’Connor travelled to Tauranga today to thank those who worked over the holiday break to manage the stink bug response. “It’s all of our responsibility to take on New Zealand’s number one challenge – biosecurity,” he said.